One of life’s simplest pleasures is being able to enjoy a piece of chocolate at the end of a long day. Unfortunately, this delicious treat has a way of quickly melting and finding its way onto your clothes, carpeting, and couch. If you love chocolate, then you need to know the best ideas for how to get chocolate out of clothes and your carpet. Below are some of the best tips for removing the unfortunate chocolate spills and drips from your favorite fabric. A chocolate stain on your clothing can be one of the most difficult stains to remove because it is known as a combination stain. Numerous ingredients in chocolate can be the cause of the stain, so there are many stain removal issues that you have to deal with at once. Since chocolate tends to soak into fabric at a slower pace than other liquids, quickly tackling it will provide you with a higher chance of successfully removing the stains from clothes and other materials. Chocolate is one of the few foods that people feel incredibly passionate about, and it goes far beyond a love for the sweetness of most desserts. Unfortunately, when consuming this decadent treat, it never fails to ultimately end up on your favorite garment, no matter how careful you are when eating it. 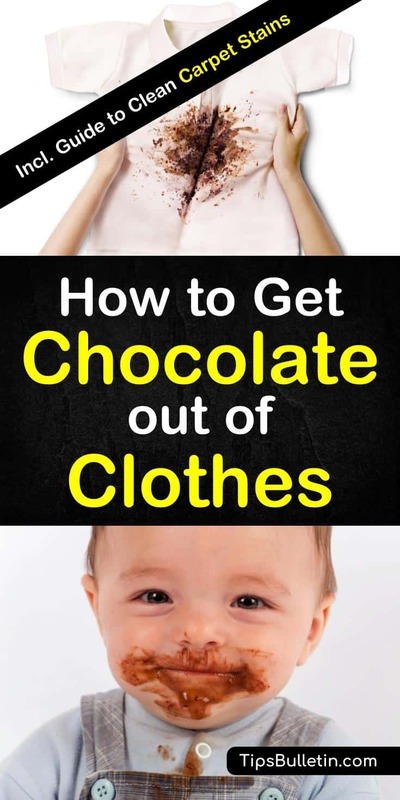 If you need to know how to get chocolate out of a shirt, you can make your own stain remover that will remove chocolate stains from your clothes. Before treating the stain, you need to scrape off the excess chocolate from the clothing. Be careful when doing this, so you don’t spread the stain any farther. Mix the ingredients in a small bowl. Coat the stain with the solution and let stand for 15 minutes. Be sure to check the fabric for colorfastness before applying the stain remover, so you don’t discolor or harm the fabric. Wash the piece of clothing in the hottest water allowed for the fabric. Make sure to check the material to ensure the stain is gone before you place it in the dryer. If you happen to miss treating a chocolate stain on your favorite shirt or pair of pants and it ends up going through the dryer, it will set the stain and make it nearly impossible to remove. Luckily, there is a way to remove set in chocolate stains, so you don’t have to get rid of your favorite shirt or pair of pants. Make sure you be extra careful when you need to wash dark clothes. Soak the set-in chocolate stain in a solution of cool water and water softener. Apply pressure to the stain to manually loosen the stain and get the water softener solution through the fabric. Presoak the item in a tub of liquid laundry detergent and water before placing in the washing machine. Wash the clothing in cold water, and check to make sure the stain is gone before putting in the dryer. We’ve all been tempted before to eat chocolate while sitting on the couch and watching our favorite movies but finding small pieces of melted chocolate on the sofa can be frustrating. Regardless of the kind of fabric that your furniture is made from, completely removing chocolate stains will take some time and effort on your part. Start by scraping the chocolate stain with the edge of the card stock or butter knife. Scrape from the outside side of the stain, moving inwards to avoid spreading the chocolate further. Place the edge of a piece of paper so you can scrape the crumbs onto the paper. Continue scraping the area until you’ve removed as much chocolate as you can. Sidenote: This is part of our homemade upholstery cleaner recipes series. If there is still chocolate residue on your upholstery, place several ice cubes in a zippered plastic bag and place over the remaining chocolate for ten minutes. Remove the ice bag and repeat the process of scraping away the hardened chocolate residue. Next, place the liquid dish soap on a damp sponge and blot the chocolate stain. Rub the spot from the outside edge, inward to lift away the chocolate. Rinse the sponge and wipe the area again to remove the soap. Pat dry with a clean, white cloth. Finally, sprinkle enough cornmeal over the chocolate to cover the affected area and allow to set for 30 minutes to absorb any greasy residue. Wipe it away with a dry, clean cloth. When dealing with chocolate stains on your carpet, you can follow the same steps that you used to remove chocolate stains from your upholstery. If you are unable to remove the stain using the previous method, you can use dry cleaning solvent for chocolate stain removal. Dry cleaning solvents can be used to clean greasy and oily stains from both your carpet and your upholstery. To use this method, you need first to test the solvent in an inconspicuous area to ensure that it won’t harm the carpet. Next, place a small amount of the solvent on a clean cloth and blot the stained area. After you’ve removed the stain, rinse the area as thoroughly as possible to remove any remaining solvent. A favorite drink of children, chocolate milk, when spilled on your carpet, can leave a sticky stain that will eventually develop an unpleasant odor if not treated quickly. The stain can easily spread because of the absorbent carpet fibers, making it essential to contain the chocolate milk stain before you can eliminate the color and stickiness and clean the carpet by hand. Using paper towels, wick out the chocolate milk until you are no longer soaking up any more liquid. Cover the remaining chocolate milk stain with table salt and allow it to sit for 20 minutes, before vacuuming it up. In a bucket, combine two cups warm water and one tablespoon liquid dish soap. Take a clean cloth and wet it in the soap solution. Ring out as much water as possible before blotting the chocolate milk stain. Start on the outside of the stain and work your way towards the middle. Rinse the soap solution with a clean, wet cloth and pat dry. Mix two cups of water and ammonia, stirring to combine. Sponge the solution onto the stain with a clean cloth. Alternate sponging the area with the ammonia solution and a clean, dry cloth. Combine the white vinegar and the remaining cup of water. Dab the solution into the carpet to neutralize the ammonia. Wick the moisture out of the rug, by pressing clean, dry towels into the carpet fibers. The above carpet stain cleaner works similar to our recipe on how to get blood stains out of carpet recipe. Chocolate stains on your upholstery, carpet, and clothing don’t have to mean the end of the world and don’t mean you have to stop enjoying chocolate. Use these simple methods described above to remove chocolate stains from all your favorite materials. We hope you enjoyed the information presented in the article and find the information useful. 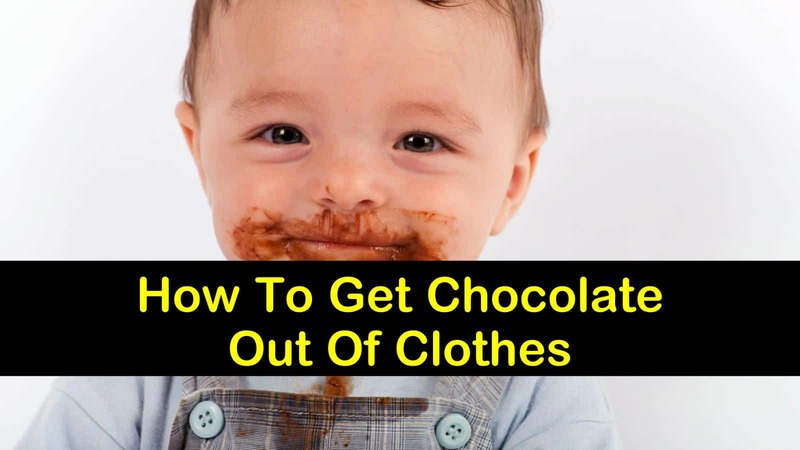 If you enjoyed learning about how to get chocolate out of clothes, please feel free to share this article with all your friends and family.